Since I am not in the studio for at least three weeks, hooking projects have proven to be a challenge. Most will get started in Vermont, but not be completed until I am back home with all supplies available. The hooking aspect of "Ice Roads" was finished this week. I still need to add the metal parts. As I did not have the correct color chain with me while traveling, I will wait to add it to the piece when I arrive back at the studio. The piece came out much softer than the original design plan. While on the road, I will need to work with the colors I have with me. The blues available were not as bright as planned and the purple not as red. The softness of the piece adds more to the cooler feel, which works well to abstractly depict ice and winter, so the piece is working out well so far. The chain, when added, will bring more attention to the purple section. There are advantages and disadvantages to working away from the studio with limited materials at hand. --Plan out designs ahead of time if possible. --Try to decide on some color schemes beforehand. You may not have the exact colors you need, but this can often lead to new ideas while hooking. Plenty of grey wool packed for my Road Series designs, some metal parts, yarn and cording. Unfortunately, I have no access to a sewing machine, so I will only be able to finish off the piece that was pre-sewn when we left. --You may be forced to make decisions you would not have had to make in the studio. Be flexible. 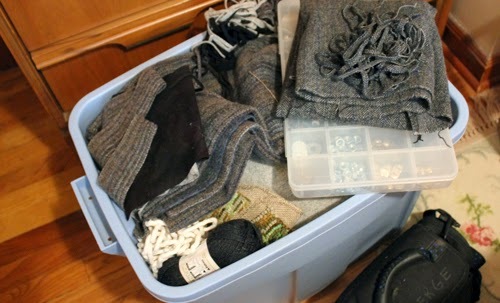 --Don't forget necessities such as scissors, hook, frame or hoop, wool, linen, and cutter. --Use the sites around you on your trip for ideas if you did not plan ahead. This is a great time to work on ideas for new designs. The piece above came about as I viewed the many bridges along our trip north. 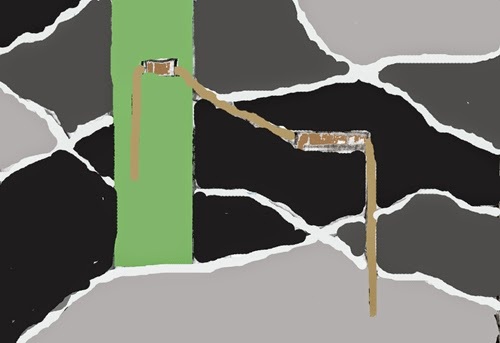 It gave me the idea to combine two works with a "bridge" between them. The bridge will be made up of two metal bars. The whole construction has not been worked out yet, but the main idea is there. --My computer goes everywhere with me. If yours is available, go through your digital photo albums for ideas. Use Photoshop to design. Cropping is one of my favorite features as it allows one to focus on certain aspects of a photo for design purposes. --This is also a good time for finishing work. I tend to hook about four or five pieces before starting finishes. If you stitch around edges before leaving home, whipping edges becomes a perfect activity while on the road. --As I am a caregiver during my time in Vermont, I cannot leave the house easily. If you are vacationing, however, think about stopping by art venues, enjoying public art or practicing your drawing skills by doing some sketches of places you are visiting. Though I am most interested in creating art, there are many other aspects of life which lead to ideas for my artwork. Take a break from the studio, hit the road and have a great day. 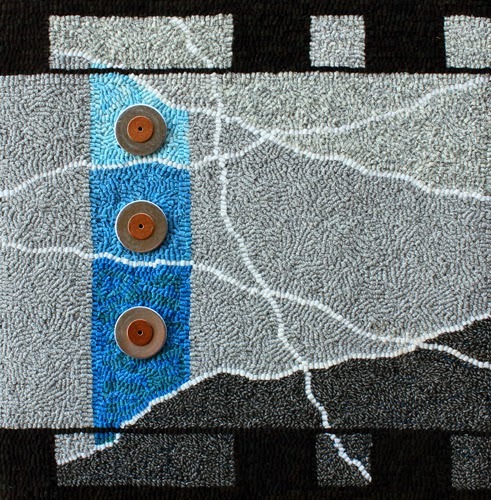 NEW MIXED-MEDIA FIBER AND METAL DESIGNS FOR "ROAD SERIES"
I received confirmation of booth space being reserved at the Carolina Designer Craftsmen show in Raleigh, NC. The show will be held over Thanksgiving weekend. Since I have been making quite a few larger pieces lately, I will need to focus on some in the $100-$300 range in order to have a variety of pricing options available. I will be on the road the next three weeks, so this is the perfect time to work on some smaller pieces. 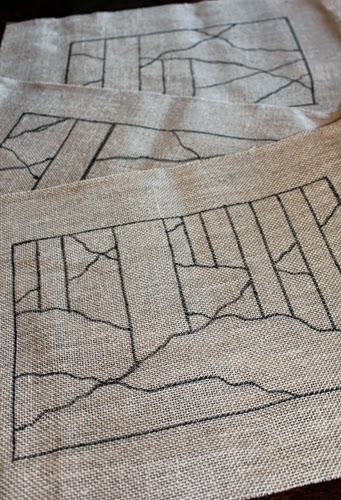 Designs drawn on linen and ready to be packed up for the trip. Below is the design process of the three pieces worked out this week. These are roughed out designs and I may make some changes during the hooking process. Here you can see how many erasure marks were made while working out the placement of lines. Usually I start out placing the lines then look at the various shapes they create. Often, changes are needed to eliminate odd shapes or lines that are too close together. 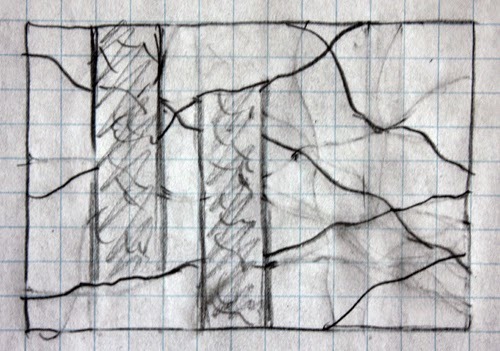 In the first sketch the parallel areas were the same width. 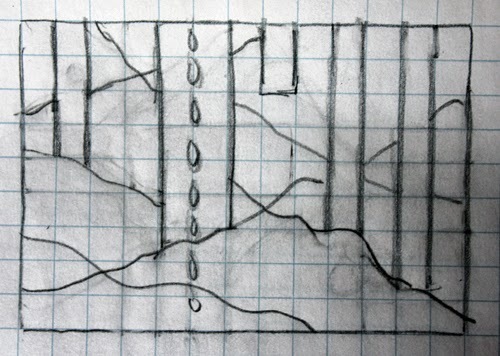 I made the decision to vary the widths for a more interesting piece. I will be placing fishing weights on the color sections and the gray marks within them gives me an idea of how they will look. I'm debating on placing a larger weight hanging down about an inch away from the top right hand side as this design still feels like it needs something. Also, the pink section may be too close to the center of the work. I'll continue working on this and see where it takes me. When searching through a box of metal pieces, I found some cylinder shaped lamp parts which gave me the idea of tunnels. A chain will be placed through the two cylinders and left to hang down the ends of each. The local Blue Ridge Parkway is surrounded by the beautiful greenery of the wooded areas on the roadside which led me to use the color green. There are a multitude of both short and long tunnels to drive through along the Parkway so I will use one short and one long cylinder in the piece. Though we are in the Summer season, I've been thinking of using turquoise or light blues in a piece. This led to the thought of icy roads. This color plan has the cold feel I was going for. The purple will add a tad of warmth to offset the coolness. A chain will hang down the center of the purple section to represent tire chains. 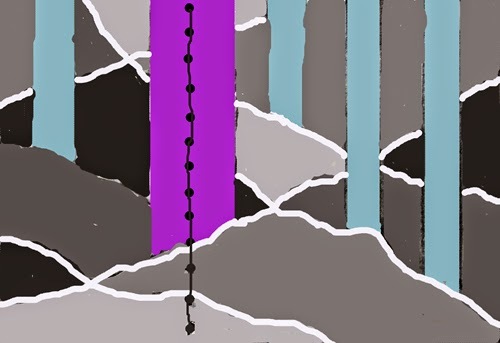 When I drew this out on linen, I narrowed the blue line directly to the right of the purple section slightly and moved it closer to the purple in order to create variance in the parallel lines. While working on both large and small works for this series I have found it interesting to see how size affects the design process. Look at works of your own or on the web and see how a composition would have to change if made larger or smaller and have a great day. I've been working on the background of the piece this week. 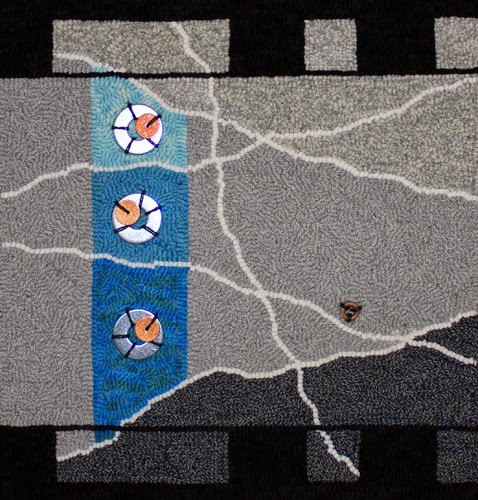 Since it is made up of various blues with navy, turquoise and pure blue, I have been placing variations of each to add more interest rather than leaving each section solid. Work will continue this coming week. If any of you have been reading the blog regularly you may have spotted some differences in works that were previously thought to be completed. I have never hesitated to look at a piece and change it if I feel the change could better the work. Just a note here to let you know to never change a work that has been accepted to a show or had a photograph of it sent to apply to a show. When applying, the photo you send must accurately reflect the work. I had used clear thread to attach the washers in "Coastal Route". The more I looked at it, the more it bothered me, as if it needed something more. I removed the clear thread and replaced it with dark gray yarn. This added more contrast and color and to me just looked better overall. The washers now blend in with the design of the piece adding to it rather than just laying on top of the hooked work. 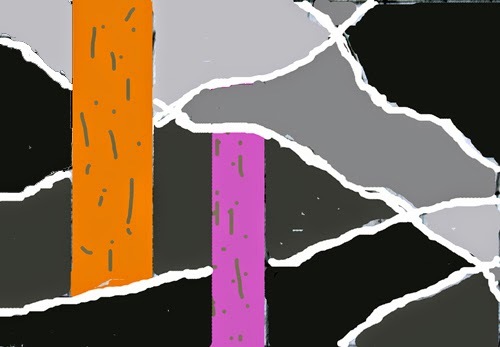 Another piece that was changed a little more drastically is "Road Movie". Again, I had used clear thread. The piece looked a little too static for me. I wanted the washers to better portray movie reels as they were moving. I removed all the washers. The smaller washers were then staggered on various areas of the larger washers to portray movement. Dark gray yarn was used to attach the washers to the hooked work. A small screw nut was stitched onto the lower right so the metal would not overwhelm and make the left side seem heavy. Before changing anything decide why you want to change it and if it really needs changes. Plan out the changes. Decide what types of changes could make the piece better. Does something need to be added or would it look better if something were removed? Older pieces can sometimes be revived and given new life when reworked. Could you possibly use an older piece as part of a new work? There are infinite possibilities. Embrace experiencing change and have a great day. It was a short week with paperwork done on Monday and taking Friday off for the 4th. I hope everyone had a good weekend. I used photos and sketches (information on last week's post) to come up with the basic design. The photo of the Coats American Inc. building and sketches were abstracted. 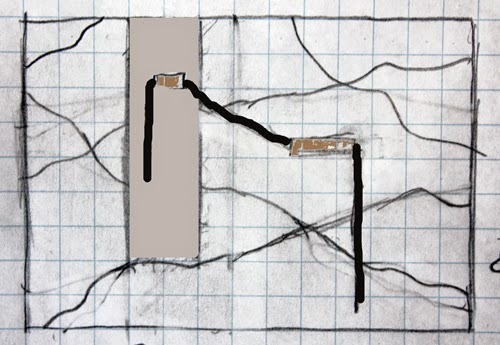 Though the hooking is one long piece, I divided the design into two sections with each being a different section of the building. Some of the detailed work was hooked in this week. Lots of bright colors in this one! You can see each end has a fold mark. The ends will be wrapped around old wooden bobbin spools to create a horizontal scroll effect for presentation of the work. This means allowing at least 6 extra inches on each end for wrapping. These areas will still need to be hooked as they will show, so I will just carry the design out on each end. 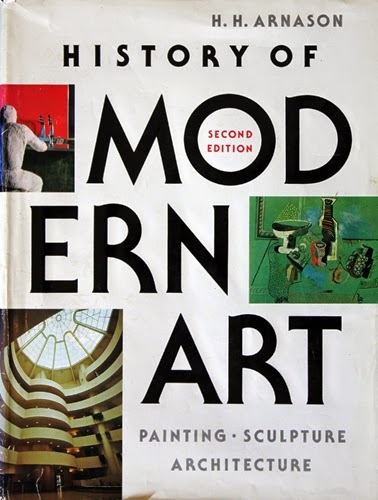 With some time off for the holiday, I decided to review past study on Modern Art History. History of Modern Art by H.H. Arnason, the link is to the updated version. Searching through the bookshelves, I found my college textbook to be in pretty good shape. I can't believe I used to lug that around in a backpack along with other texts. It's quite heavy. The Modern art period runs from the 1860's to the 1970's. Some books state the Modern period started as early as 1784. Work after the Modern period is considered Contemporary. Since Impressionism is at the start of the Modern period, I have decided to brush up on my French. I have forgotten pretty much all but the basics from my college days and have decided to focus on reading french for art purposes and forgo the speaking aspect. My plan is to read some French art magazines and I really have no one to actually speak French with. 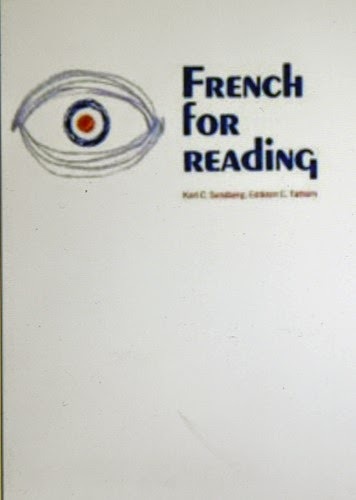 French for Reading by Karl C. Sandberg was recommended to me and should arrive Tuesday. It will be interesting to see how much I remember. Since I haven't studied extensively on Expressionism and Germany was at the forefront of this movement, I am also planning on studying the German language. My husband lived in Germany for a 9-month period a while back, so maybe he can help me out with this. 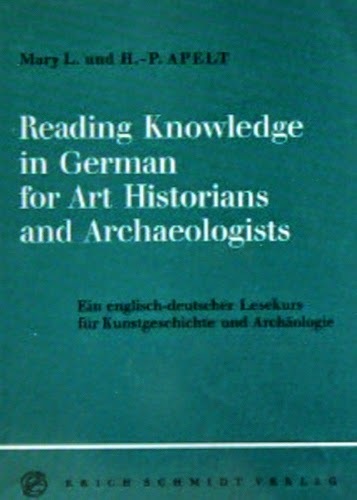 Reading Knowledge in German for Art Historians and Archaeologists by Mary L. and H.P. Apelt. This is an expensive book so I am still looking around for the best price. 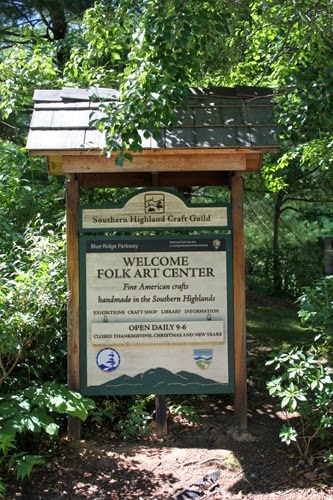 My husband and I took a ride along the Blue Ridge Parkway this weekend and stopped to look around the Southern Highlands Folk Art Center. There was quite a bit of textile art on display, but unfortunately, they did not allow photos inside the building. 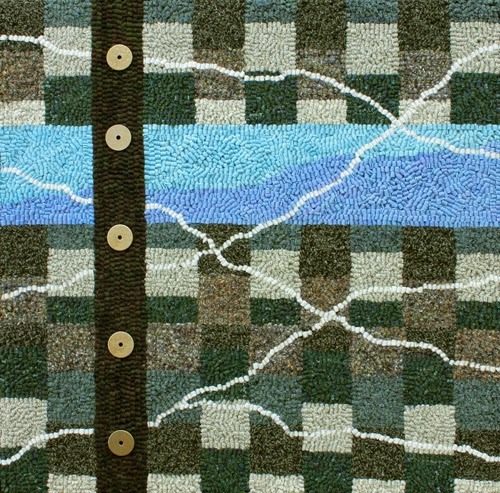 Quilting and weaving were well-covered and it was interesting to see the different approach in style each artist took. 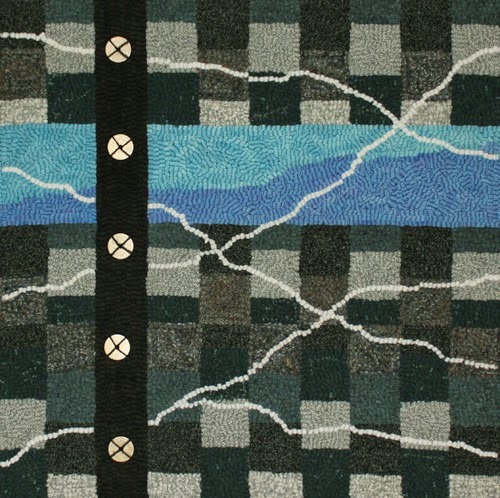 One artist focused on the Morse Code system and developed it in her weaving which I found fascinating. 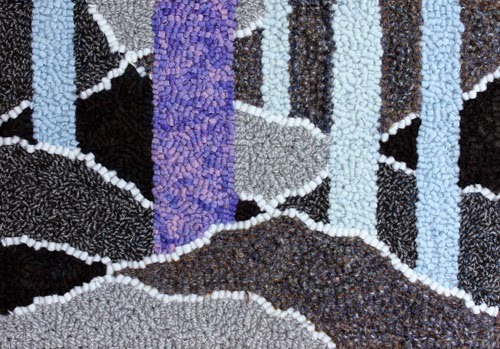 Dyeing technique was the focus of another artist's work. I do wish more of these artists had websites. I see artwork when I am out and about and may not purchase at that time. I very often go home to look up artists' work and am so often disappointed that they have no site. 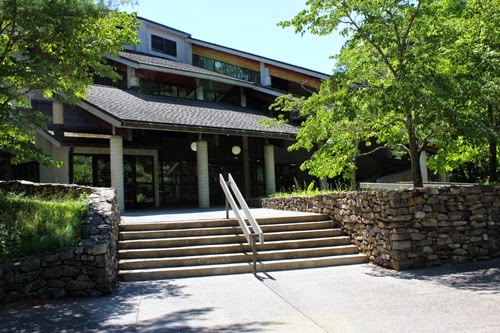 If you are ever traveling along the Blue Ridge, the Folk Art Center is well worth the stop. Art leads me to so many places: studying languages and history, stopping by new galleries and art centers and exploring new areas for inspiration. Find where it leads you and have a great day. Content Copyright Lori LaBerge. Powered by Blogger. Copyright © 2009 In the Studio and Elsewhere. WP by Hybrid..